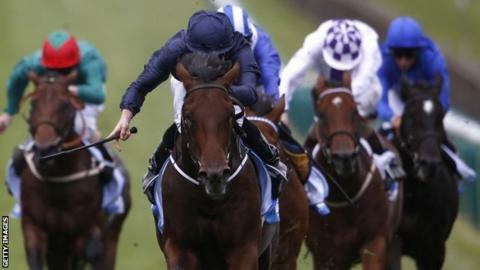 Favourite Air Force Blue scored a stirring win in the Dewhurst Stakes at Newmarket for trainer Aidan O'Brien. The 4-6 favourite powered to victory by three and a quarter lengths from 20-1 chance Massaat. It was a convincing victory for the colt, owned by the Coolmore Stud team, with Emotionless a disappointment for the rival Godolphin stable. Jockey Ryan Moore indicated Air Force Blue was probably the best two-year-old horse he had ever ridden. Meanwhile, 50-1 outsider Grumeti, trained by Alan King, won the Cesarewitch Handicap in a photo finish from Oriental Fox. Winning rider Adam Beschizza was completing a 764-1 autumn double, having won the Cambridgeshire Handicap on Third Time Lucky. Air Force Blue is now favourite for next year's 2,000 Guineas at Newmarket, at odds ranging from 6-4 to evens. "Probably at this stage, I'm struggling to think of any better [juvenile] I've ridden. He felt like there's more to come," said Moore. After the striking successes of their filly Minding (in Friday's Dubai Fillies' Mile) and colt Air Force Blue, Coolmore partner Derrick Smith was asked about the 2016 Classics. "We seem to be in good shape," he said. What masterful understatement. The Irish operation's stranglehold on flat racing's most prized trophies is now an iron grip. And they didn't just impress visually; from the saddle, Ryan Moore, a jockey not given to any form of hyperbole, described both as "exceptional". There is much for the Tipperary-based team to look forward to during the winter.